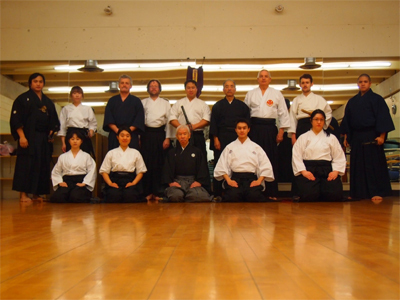 The Vancouver Eishin Ryu Iaido Club is dedicated to the study of the traditional Japanese martial art of iaido. Iaido is the art of drawing a katana (commonly referred to as a Samurai sword) and delivering a decisive strike against one or more opponents. Iaido is one of the oldest Japanese martial arts, with a history that can be traced back at least 450 years. Iaido waza (techniques) always begin and end with the student's sword sheathed. Unlike kendo, which is the art of sword-fighting once swords have already been drawn (similar to Western fencing), iaido focuses on quick and effective responses to unjustified or surprise attacks. Students of iaido, known as iaidoka, do not compete against one another. Waza are performed individually against imaginary opponents. However, students should aim to react and behave as though they were engaged in a life or death situation. The ability to achieve focused concentration and stillness under such oppressive circumstances is one of the many goals in iaido. There is a saying in Japanese: 'Saya no uchi no kachi.' This translates roughly to 'Victory in the sheath.' and is the ultimate goal of the sword arts. By perfecting oneself through iaido practice, battles can be diffused or won before taking the drastic step of unsheathing a sword. Are you interested in giving Iaido (pronounced 'e-eye-doe') a try? Consider yourself to have a standing invitation to come and practice with us. New people are always starting and we're a friendly bunch. Come on out this Tuesday or Saturday! We welcome anyone who is interested to come and try a class. No previous martial arts training is required and you don't need to purchase any equipment for your first class; just be sure to wear comfortable, loose fitting athletic clothes. We'll be happy to lend you a bokken (wooden sword) to practice with. Alternatively, if you feel you would rather see what iaido is all about before joining in a practice then you are welcome to come and observe a class at any time. We practice every Tueday, Thursday and Saturday at the UBC location and every Friday at the Marpole location. Practice times are shown below. For your first practice please try to come 10 minutes early so we can give you a quick introduction to iaido. We look forward to seeing you! If you'd like to let us know you are coming, or you'd just like a little more information, please contact our instructor Hiro Inoue Sensei. Click here for directions on how to get to our UBC and Marpole Dojos. Iaido can be enjoyed with little or no financial commitment. While we normally wear a white gi top and a black hakama bottom, but it's fine to practice in loose fitting athletic clothing. Our club can also loan bokken (wooden swords) to committed members until they can afford to purchase their own equipment. After your first complimentary practice or two, if you wish to continue with Iaido you are required to register and pay the enrolment fee. Practices held at the UBC location operate as a martial arts course offered by UBC REC. To join this practice, you have to register & pay fees to UBC. They take care of the facilities & insurance. These practices are open to anyone. You do not need to be a student or staff of the University of British Columbia. Practices held at Marpole location must be registered for seperately from the UBC practice. To register for practices at the Marpole location please go to the Marpole Community Centre online registration. When starting out, all that is required to practice iaido is loose fitting athletic clothing and a bokken (wooden sword). Our dojo has a limited number of loaner bokken and so it is the first item that you may want to consider purchasing for yourself if you intend to continue with iaido after your first few practices. Plain bokken can be purchased for around $20-$45 Canadian. Once you have decided that iaido is really something you are interested in then you may want to consider purchasing the uniform. The basic uniform consists of a black hakama (traditional japanese pleated horse riding pants), white gi (martial arts top), obi (sash). It is important that you purchase an obi that is able to be wrapped around your waist three times before being tied. If you look online or in martial arts stores these will be called Kaku Obi (stiff sash) and they are meant for iaido. Any colour will do since belt colour is not related to your dan level in iaido. You will notice that muted colours are most common in our dojo because iaido is not meant to be flashy. Typically, a basic hakama and gi will cost between $50 - $80 each, and a good kaku obi will cost about $30-$45. Once you have practiced with a bokken for a while and become adequately proficient then Sensei will recommend that you purchase a metal practice sword called an iaito. If you come to practice regularly Sensei will probably recommend you get an iaito between 6 months to 1 year after you start. It is important that you wait until Sensei recommends you get an iaito for many reasons. First, though an iaito is not sharp, if you lack the skill to use it then you may injure yourself. Second, there are many poor quality iaito, shinken, and katana on the market and many disreputable vendors. Many iaito, shinken (real/sharp sword), and katana vendors sell cheap ornamental swords that should never be used for anything other than hanging on the wall. These poor quality wall hanger swords can fall apart over time or even come apart in your hands during practice. Poor quality swords put you and your fellow classmates at serious risk of injury. Third, you won't know what size to get. When you begin to look for an iaito you will see how many variations and sizes there are. It is important that before you purchase an iaito that you speak with Sensei and he approves the length of the blade and handle, colours, and vendor. For the most part you can be as creative as you want with your iaito, but it would be a terrible shame if you spend all that money on a sword that is the wrong size for you. An iaito will be your most significant investment. A good analogy for how much an iaito will cost is that they are like mountain bikes; you can get one for about a $300, but you could also easily spend more than a $1000. Please consult Inoue Sensei prior to purchasing an iaito. Sensei and our other club members will happily aid you in purchasing the appropriate iaito (or any other equipment). Generally, you can expect to spend between $400-$700 Canadian for a good quality iaito. The Vancouver Eishin Ryu Iaido Club is an officially accredited dojo of Seito Seiryu Muso Jikiden Eishin Ryu Iaido Kokusai Renmei (IKR), also known as Iaido Kokusai Renmei (Iaido International Federation). Esaka Sensei is the president of IKR and the head of our organisation. At a certain point Inoue Sensei may recommend that you become a member IKR. Membership in IKR allows you to be tested for dan ranks amongst other things. The initiation fee is 10,000 yen and the annual fee is 5,000 yen. Esaka Sensei, Hanshi, 10th dan is a direct student of both the 20th Soke, Kono Hyakuren, and the 21st Soke, Fukui Torao. He holds a Hanshi, 10th dan, in Muso Jikiden Eishin Ryu Iaido and regularly instructs iaido practioners of all levels in Japan, North America, Asia, and Europe. He is one of the world's leading sword practitioners. 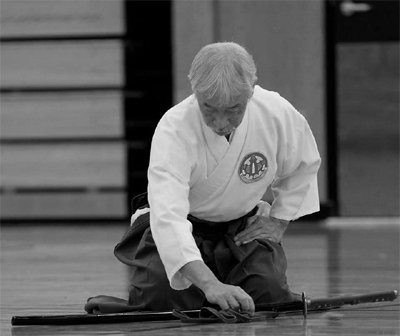 We are extremely fortunate and honoured to have hosted Esaka Sensei many times in Vancouver. It is rare for an individual of his calibre and experience to provide instruction outside of Japan. His guidance and wisdom over the years has strengthened our dojo and has helped our members sharpen their skill and knowledge of iaido. We admire his leadership and hold him in the utmost respect. We look forward to the next time that Esaka Sensei is able to train us in Vancouver. Iaido is practiced by many different schools and organizations worldwide. The history of iaido and how it has spread around the world is truly interesting. This section is to make note of specific people from the wider iaido community worldwide who have made a special effort to share their knowledge and skill with our dojo. We are very thankful for the support and training that Kato Sensei, Hanshi, 10th dan (ZNIR), has given to our dojo over the years. The Vancouver Eishin Ryu Iaido Club holds Kato Sensei in a position of respect and appreciation within our dojo for his efforts to teach and promote iaido. 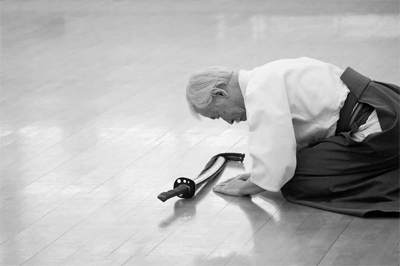 We greatly admire and respect his dedication and the common values we share as part of the wider iaido community. We look forward to any opportunity that the future may hold to train with Kato Sensei again.